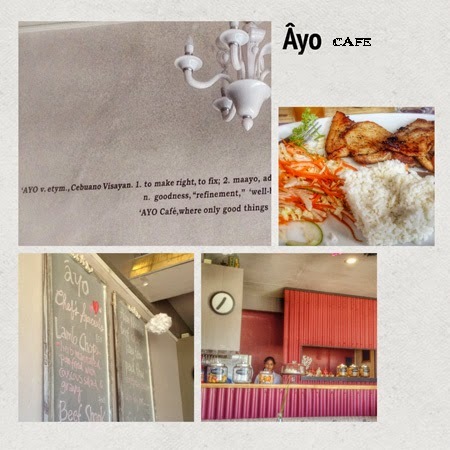 Away from the bustle of Tacloban City proper and along Apitong Road sits this attractive café named “Âyo.” Nestled in a strip mall structure area, it’s a good place of reprieve when one is traversing the diversion road on the Maharlika Hwy. The resto has a mixed fare of Filipino and international cuisine, pasta and sandwiches, drinks are served primarily in pitchers and the clientele consists of people who only know where it is. To be candid, it’s making me wonder whether the proprietors (which are also the owners of Sunzibar and Canto Fresco) consciously opened this eatery here especially for customers who do not want to be bothered by the agitation in the city. Be that as it may, it is enjoyable as a place to eat. Âyo does have tasty preparations but the Chef’s specials on the board is pricey as they come understandably because the ingredients are a rarity in Tacloban and Leyte. Example: Lamb Chops w/ Couscous Salad for P800, special cuts of beef and other entrées prepared with international flair for just as much. Happily, these are not all that they serve. On the menu are more reasonably priced items which share an affinity for the items served in Sunzibar. Parking is not hard to come by because as I mentioned, Âyo is not at the hubbub of TC. PS: Âyo was named after the Cebuano/Visayan word for “good.” if you don’t believe me, check out the decal of the word's definition on the upper right of the wall of the place (pictured on the collage). A clever touch yes?